My friend Anna is amazing. And so is her beautiful daughter. Together, they’ve given Daughter most of her wardrobe this past year. So to thank them, I made this dress using the Little Blue Boo pattern I used for Daughter’s dress a few months ago. Anna said her daughter’s favorite color is Orange. 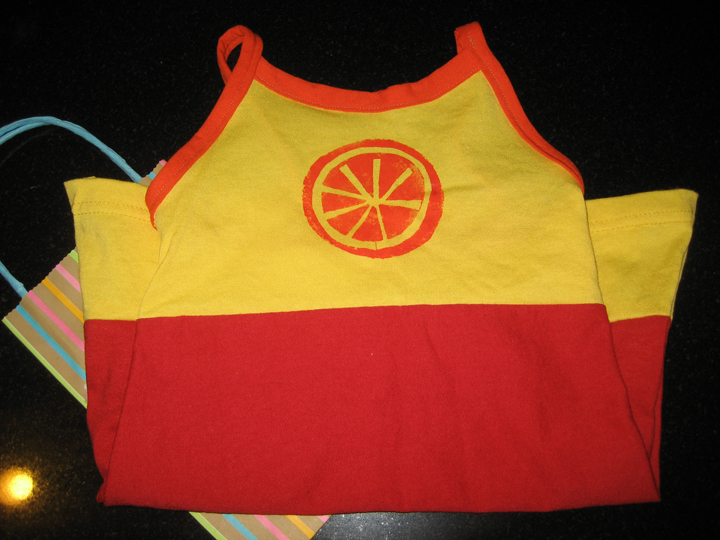 But instead of just making an orange dress, I instead used red and yellow T-shirts for the main dress and an orange T-shirt just for the straps. I printed the orange using contact paper and fabric paint at Jen’s latest pARTy. Anna was in the other room while I did the painting, so I had to work in stealth mode. It worked, so never saw it and had no idea. The best part was when she showed it to her daughter and she said, “Wow, it’s beautiful.” Geez… I couldn’t be happier. Anna – I need a photo of this on your beautiful daughter on the beach, please! i heard first-hand from anna that the dress was adorable. can’t wait to see more photos! love the stenciled orange. Adorable, indeed. Like wearing summer itself! Geez I’m behind on my reading! Yes, it’s lovely AND there’s plenty of room to grow. I did get beach pics and will put them up soon.